The Chewelah Arts Guild is a non-profit community support group that has been promoting the Arts in the Chewelah area since 1999. The purpose of the Chewelah Arts Guild is to support the growth, development, appreciation and understanding of the arts in their various forms and to make the arts accessible to all members of the greater Chewelah community. Chewelah: A community that values, supports and promotes the arts. ​Chewelah Arts Guild Member now. Download the 2019 Annual Chewelah Quilt Show form to submit a quilt. Details for submission are in the form. Quilt Show on Memorial Day weekend. It’s a different time of year and a new orchestra, but great symphonic music is returning to Chewelah Peak. 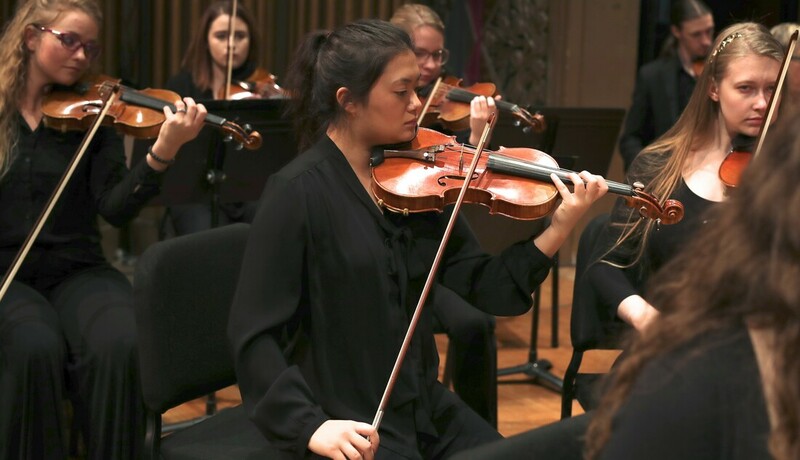 Gonzaga University Symphony Orchestra makes its Music on the Mountain debut May 18 in a 2:00 p.m. concert presented by Chewelah Arts Guild and Chewelah Peak Learning Center. According to CAG President Dawn McClain, classical music lovers can expect the same music mastery the event has delivered for 16 years. “We’re excited to welcome the GU Symphony to Chewelah Peak. This is an orchestra that attracts some of the world’s top soloists to perform with them, and we know it will be a great afternoon of music-making,” McClain said. The orchestra is a blend of gifted GU music students, Spokane professionals, and Gonzaga alumni. The conductor is Kevin Hekmatpanah, who doubles as a cellist with the Spokane Symphony. What can the MOM audience expect? “For the music lover, Spokane holds few pleasures as great or as dependable as the concerts of the GU Symphony Orchestra,” wrote Spokesman-Review music critic Larry Lapidus. Their performances “leave ‘em in the aisles, begging for more,” he added. A better view of the musicians is another new feature of this year’s MOM. “For years our audience has asked for this, and thanks to a Vinson Fund grant, we’re bringing in a portable stage that will raise the orchestra a bit higher,” McClain said. MOM tickets are available now at Valley Drug and Akers United Drug in Chewelah, House of Music in Colville, and on this website. The price is $20 through April 24, then $25; children 12 and under are $15. Your ticket includes snacks and beverages at intermission. ​This scholarship is offered annually to a graduating senior from the greater Chewelah region. This includes students at any local or virtual high school who resides in Chewelah, Valley, Addy, Springdale, Blue Creek or Summit Valley. Scholarship applications are available below and Friday, April 29th at 4:00 p.m. is the deadline for submissions. Eligible students are those that have demonstrated a strong interest in the arts and will be attending college in an art or art-related field. Application packets are available from your art teacher, school counselor or the Arts Guild. Scholarships are awarded at the Seniors Honors/ Awards assembly. For more information contact Dawn McClain at dmmcclain54@gmail.com . are held the 3rd Tuesday of each month. N E WA HEALTH PROGRAMS MEETING Bldg.